Vanilla (Span, diminutive of vaina, a sheath, the pods being supposed to resemble in shape a little knife sheath), the botanical name of a genus of orchids, and the popular name of the fruit or pods of the plant. The species, of which there are but a few, are all climbing plants (an unusual habit with orchids), their slender stems emitting aerial roots by means of which they climb upon and ramble among the branches of trees; the fleshy leaves are heart-shaped at base, and their flowers, which are thick, fleshy, dull-colored, and inodorous, are produced upon small lateral branches; the fruit, when fresh, is about the size of the little finger, somewhat three-cornered, fleshy, firm, smooth, and plnmp; when cut open it exudes an inodorous slimy juice, which contains numerous spiculae of oxalate of lime, which have an irritating effect upon the skin; the interior is one-celled, with 12 longitudinal ridges upon the walls, upon which the minute seeds are borne. The most important species is V. planifolia, a native of the warmer parts of Mexico, and introduced into Central and South America, and also various parts of the East Indies by cultivators; it requires a warm, moist atmosphere, and can only be cultivated in localities presenting these conditions. Vanilla is propagated by tying a shoot about 3 ft. long to the base of a tree; the plant comes into bearing in three years, and will continue to be productive for 30 or 40 years. The natural conditions have been imitated under glass, and pods of superior quality have been produced in Europe. "When quite ripe the pods split longitudinally into two unequal valves, and they are therefore gathered before complete maturity; the drying of the pods is a long process, consisting of alternate wrapping in woollen cloths and heating, and exposing to heat uncovered, a manipulation which develops their peculiar odor and gives them a dark brownish color; they are also oiled in the course of curing. 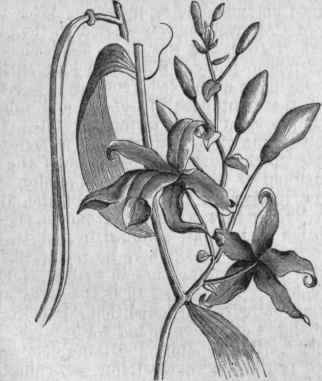 Like those of most other orchids, the flowers of vanilla depend upon insects for aid in fertilization; for a long time the plants, while they grew vigorously and flowered freely in the East Indies, produced no fruit, the proper insect not being present, and fertilization in those countries is now performed artificially. The vanilla pods (or beans as they are popularly called), as found in the shops, are like fleshy flexible sticks, 3 to 8 in. long, 3/10 to 4/10 in. wide, flattened, and narrower and hooked at the stalk end; the surface is furrowed lengthwise, and is often covered with minute crystals; within are found innumerable, minute, shining black seeds, imbedded in an aromatic viscid pulp. The odor and flavor of vanilla are peculiar, and to most persons highly agreeable; it belongs to the same class of odors with those of melilot, vernal grass, and Tonqua bean, but is distinct from each. The odor is not due to a volatile oil, but to a crystallizable principle, vanilline, which, having very slight acid properties, has been by some chemists termed vanillic acid; about 1 per cent, is contained in the pods, either as crystal's or dissolved in the viscid liquid which surrounds the seeds; it is soluble in ether and alcohol, especially when warm, in boiling water, in fatty and volatile oils, and in alkaline solutions. An interesting fact connected with vanilline is that of its artificial production; Tiemann and Haarman of Berlin in 1874 succeeded in converting coniferine, found in the sap of pines, by means of chemical agents, into vanilline. - The principal supplies of vanilla come from Vera Cruz and Tampico. Its use is that of a condiment or flavoring material, and as such it was known to the Mexicans before the visits of the Spaniards, the natives employing it, as is done at the present day, to mix with chocolate. It was long in use in Europe before its origin was known. In flavoring chocolate it is ground up with the seed, but for candies, ice cream, and cookery, it is most generally employed in the form of an extract; this is prepared by cutting the pods into small pieces, thoroughly triturating them with sugar, then digesting with diluted alcohol, and afterward percolating. Much of the extract is adulterated with Tonqua bean and the cheaper kinds are made solely from that; one familiar with the peculiar and delicate odor of vanilla can detect any admixture of this kind by the smell. It has been said that in all the cases where poisoning has taken place from ice cream vanilla has been the flavor employed. It is supposed by Schroff that in these cases the extract has been prepared from parcels of the drug which have been besmeared with cashew-nut oil. - Wild vanilla is a name given to a liatris (L. odoratissima), also called hound's-tongue and deer's-tongue, a species of this showy genus found in most of the southem states, but especially abundant in the swampy pine woods of Georgia and Florida; it has broad spatulate leaves, those at the base 8 to 12 in. long by 2 or 3 in. broad, and a large branching panicle of heads of purple flowers. The fresh leaves have an unpleasant odor, but in drying a large amount of coumarine is developed (see Tonqua Bean), and they then possess a very strong fragrance. The leaves are collected in large quantities in Florida, and are shipped to northern ports and to Europe; they are used to scent smoking tobacco and snuff, by being cut or ground up with them, and are laid among cigars for the same purpose.